Frank's mobile armor, Frankystein Mark II enters the battle. Although it looks like wood, it's actually made out of a rare metal called Frankarium. Seriously! 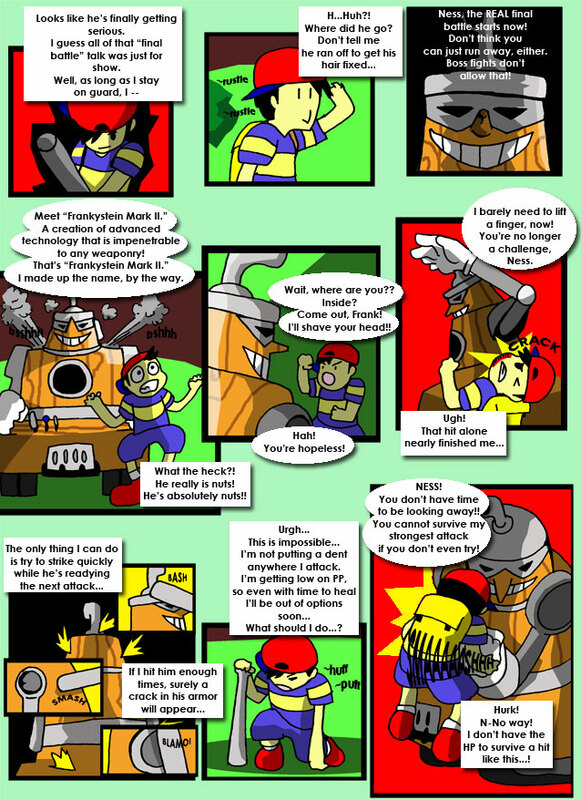 Messing around with some sketches, I decided to put them together into a comic that will eventually span all of Earthbound. A bit of a slow start, and I went through some trial and error, but now...the adventure begins. Ness is woken up by the noise. Also, he has really bad hair. ...Also, COOKIES. Are you a bad enough dude to give King a bath? Don't ask why I chose a maple leaf design for that background, I have no idea where it came from. Also, Ness is finally outside so things actually start to happen. Yay!